Jack Clay displays a citation passed by the Missouri House of Representatives in honor of his valuable contribution to the historical knowledge of the local area. 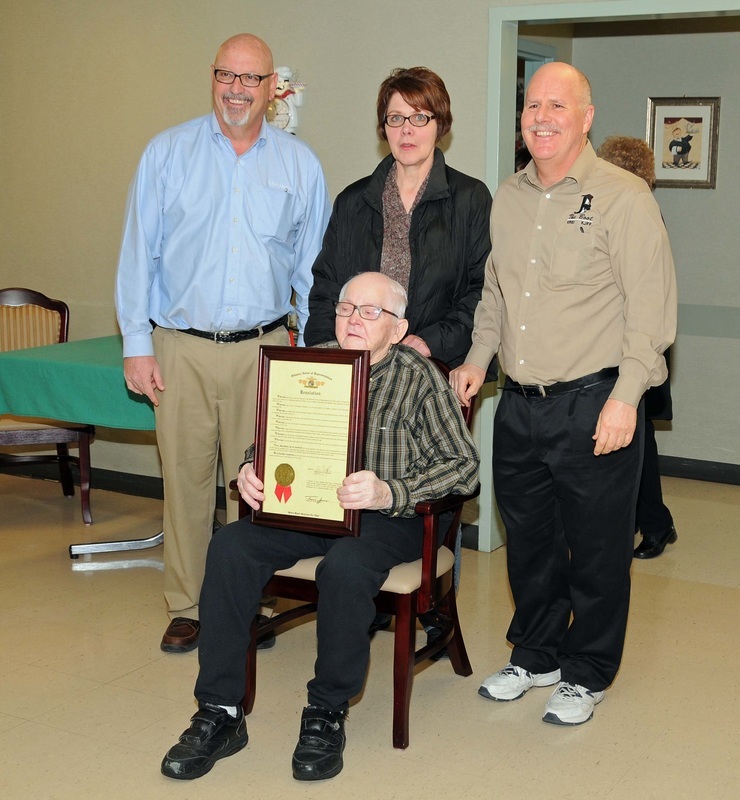 He is shown here at the event held last year at Camelot Nursing and Rehab that was organized by Janet Douglas, Mark Toti (above right) and Rep. Kevin Engler (above left). April 28 -- Jack William Clay, one of our city's leading historians, passed away yesterday at the age of 91. As a key member of the St. Francois County Historical Society for many years, Clay could often be counted on to answer questions from time to time about our area's history. His knowledge ranged from such topics as the Civil War in this part of the state, the local mining industry, and ownership record of many of the older homes in Farmington. In the mid-1980s, Clay and the late Gertrude Zimmer, also a noted local historian, worked with other members of the Historical Society to assist the St. Francois County Court in organizing many of its old records so that they could be put on microfilm. That project involved weeks of hard work before it was completed. Clay's family had long been involved in real estate in this area and as a result Clay possessed extensive knowledge of many of the town's fine old homes. Although he had been confined to a nursing home in recent years, Clay's mind seemed to be as sharp as ever when he was visited by his many friends. He will be sadly missed.